Author Paul Moorcraft was interviewed on Radio Europe in January 2017. Listen to the interview on demand via www.talkradioeurope.com. You'll be £15.25 closer to your next £10.00 credit when you purchase Dying for the Truth. What's this? It starts by examining how journalists have plied their trade over the years most particularly from the Crimean War onwards. Their impact on the conduct of war has been profound and the author, an experienced journalist, explains in his frank and readable manner how this influence has shaped the actions of politicians and military commanders. By the same token the media is a potentially valuable tool to those in authority and this two-way relationship is examined. Technical developments and ’24 hour news’ have inevitably changed the nature of war reporting and their political masters ignore this at their peril and the author examines the key milestones on this road. Using his own and others’ experiences in recent conflicts, be they Korea, Falklands, Balkans, Iraq or Afghanistan, the author opens the readers’ eyes to an aspect of warfare that is all too often overlooked but can be crucial to the outcome. The public’s attitude to the day-to-day conduct of war is becoming ever more significant and this fascinating book examines why. Moorcraft's warts-and-all look at the draft of conflict reporting provides an antidote to today's code red headlines about misinformation injected into the media machine. Journalist's would do well to borrow Moorcraft's patient tone. Professor Paul Moorcraft, a seasoned military combat and multi-media political journalist, with over 40 years front line fighting experience, has written a powerful and fascinating new book on the history of war reporting. Entitled 'Dying For The Truth', it is unquestionably one of the finest books on hand-to-hand war fighting. An authoritative book with a generous amount of maps and illustrations. Moorcraft has been most thorough in his coverage of war reporting. His style makes for easy and interesting reading. A number of ‘hacks’ such as Hemingway are mentioned, with the entire text being generously punctuated by quality battlefield photographs, portraits, maps and cartoons. There are a dozen pages of endnotes, a most comprehensive bibliography and an east-to-navigate index. Moorcraft’s work provides much-needed coverage of the important impact of reporting of conflicts in the past and current days. A very worthwhile addition to any collection of military history. In his latest book 'Dying for the Truth,' Paul Moorcroft, a seasoned war correspondent, takes the reader on a journey through war zones, past and recent: describing how their reports influenced public opinion, and used by some military generals to promote their image. War correspondents are not necessarily welcomed by the military and when ever possible, caged. The public expect 24 hours news. On D Day, the first censored news reports and sanitized photographs were controlled, fed to radio and newspaper through official channels. With today's technology, the public can watch the bombing and firefights, on television, as it actually happens. Leisure entertainment! The almost instant coverage of civilian casualties, deaths through friendly fire, starving children and the march of refugees across borderless Europe, attracts viewers and sells newspaper. The news reports can destroy governments and influence public opinion; Vietnam anti-war demonstrations in America brought the war to an end and pictures of millions of refuges fleeing across Europe, played a part in the British public's vote to leave Europe, are classic examples. The book is not a page turner but a fact driven exposure of how war correspondents risk their lives and give their lives, to bring raw, and sometimes brutal stories to our television screens and daily commuters newspapers. experiences of recent conflicts. The writing style has a light touch, with many photographic examples of his work. The war correspondent has long been a feature of warfare, but the introduction of photography, during the American Civil War, revolutionised the work of the military journalist. A readable and very informative work. … Paul Moorcraft is a veteran war correspondent who has no capacity to understand health and safety. As often a freelancer as a journalist with Times and the BBC, he has enjoyed much freedom from institutional restraints—so much so that his reputation as a swashbuckler is well-known. But he also has a PhD, is a visiting professor at Cardiff University in Wales, has worked for the UK Ministry of Defence and instructed at Sandhurst. As far as war correspondents go, he is unusually qualified to look behind the scenes and discern, often disquietingly, how we are getting it wrong or, at best, only partially right. 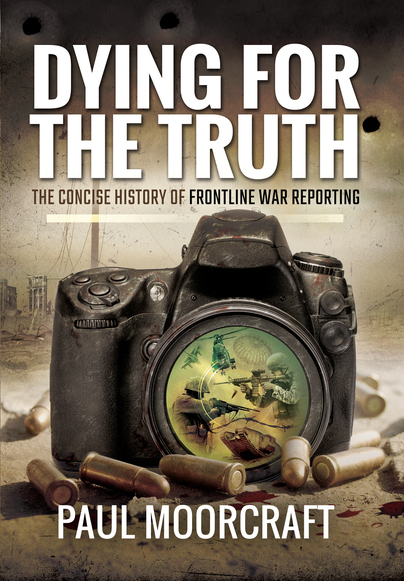 His new book,Dying for the Truth: The Concise History of Frontline War Reporting, is not only a history of the profession, but a critique, and a chapter in a long autobiography. Although still a pundit on wars for international television channels, his reportage these days is for his own books, of which there are a great number, covering for instance wars in Rhodesia, Sri Lanka and Sudan; he has also operated in Afghanistan, Iraq, Palestine, Nepal and Syria. The established joke upon meeting him is to mock exclaim, Good God, you’re still alive! But gathering frontline material for books means narratives about history, philosophy and religion as well as strategy, battles and carnage. The speed of his writing means he doesn’t always get things right himself, and certainly not complete. Yet his book on jihad, for instance, was more nuanced— if breathlessly so—than most disquisitions on the subject for a non-academic readership. He is best when writing about his own adventures and the reflections that arise from them, reflections established in some appreciation of history, philosophy and religion, and these are well represented in Dying for the Truth. … It is in those wars where social media, and indeed other journalists of any sort, are not a frequent species, where Paul Moorcraft has made a latter-day reputation—and as he covers the misunderstood and neglected wars of the world, his capacity for discerning judgement has grown. It is probably true to say that in his early days, covering Rhodesia as the white army made its great last stand, he was a gung-ho personality of not fully progressive views. Covering Darfur, the quality of his commentary and reflection is a benchmark. Not everyone will agree with his views, and specialist scholars will dispute them. But few, writing as journalists, will be able to refute them. His balanced views on Darfur reflect Moorcraft at his best and most controversial. He also briefly but pungently reflects on WikiLeaks as a demolition ball to the state-management of reportage on war (despite briefly making it clear he can’t stand Julian Assange). But the book’s most plangent quality comes when he talks about war correspondents who were killed—as brutal broadcast examples of warning, as in the execution of Daniel Pearl—and his reflection that war reportage now takes the place of religion in its depiction and meditation upon life and death and reasons for dying. Whether stage-managed, sanitized or not, fundamental human issues of mortality are its stuff of trade. If war correspondents have become the theologians of our day, while also being manipulated by state machines, while still trying to stand independently from them, while still—chillingly and inescapably—giving publicity and oxygen to the perpetrators of massacre simply by covering those massacres, are there any longer journalists as heroes like William Howard Russell? They remain a form of witness, certainly. And, by and large, they no longer portray themselves like the BBC’s John Simpson in seeming to single-handedly liberate Kabul. But they are now one part of something that can act as an antidote to war, and that is good diplomacy, armed with good facts, furnished by good journalists working with other reflective practitioners and thinkers on international relations. Like many people, my knowledge and understanding of Islamic militancy has been fragmentary, coming mainly through the mainstream media. What Paul Moorcraft does in this excellent book is pull those fragments together to form a complete picture. The author brings an astonishing depth of knowledge to the debate, having reported from the 'front line' and even shared a coke with the mujahideen. He also writes with a wit and clarity that makes this book a pleasure to read. Although Moorcraft is obviously no fan of radical Islam, he is equally incisive in his criticism of the West. In a just world, every politician should read this book. Unfortunately they won't and the same mistakes will be repeated. I've worked with this gentleman. 'Daring' is a word which is quite under-stated when it comes to where he's been and the wars he's covered. 'Still alive' is a term commonly used about him - in tones of slight disbelief. Another barnstormer from Dr Moorcraft. This is a comprehensive review of the role of the war correspondent through the ages.It is strong on historical detail and analysis of the developing role of the correspondent as the world around him/her changes. Moorcraft provides much detail and name checks many the well known,and not so well known, players in the field. The use of recollections from those in the field,himself included, adds a real human touch to the book. The book also doubles as a good introductory guide to much of the political history of the relatively recent past and is comprehensive enough to take the reader back to some of those "events" often lost in the greater scheme of things - remember Biafra? In his normal style the author takes great pleasure in demolishing sacred cows and whilst generally writing with open admiration for many of his fellow correspondents is honest enough to point out that the search for the next drink can assume as much importance as the next story when the going gets tough! An informative and entertaining read. In 'Dying for the Truth', Moorcraft has written perhaps the definitive history of war reporting. It is difficult to find another study that provides both the historical backdrop and contemporary detail provided in 'Dying for the Truth', ranging from Thucydides to ISIS. The author has obviously been a participant observer and appears to be a poacher turned gamekeeper, as his biographical details show that having been a war correspondent he had also worked as a media relations officer for the British defense ministry. It is unusual to have this sort of a book written by someone who comes at the subject from an academic, journalistic and governmental background. This has probably provided a welcome balance and the cynicism necessary to review a field of study replete with governmental deception, deliberate disinformation and human error. The author also brings the reader up to date in how journalism - and especially war reporting - has been transformed in the last two decades with the advent of new media. Moorcraft is candid enough to recognize the elephant in the room and admit that despite institutional claims to the contrary, most journalists take sides in conflicts. If there is a weakness in the book it is that there is not enough of an examination of how governments have recently deliberately used deceptively generated social media to make the case for military intervention, for example in the case of Libya in 2011. From a technical point of view, 'Dying for the Truth' is a well-produced and nicely-presented book by a noted British publisher of books on military history. While this is not always the case generally, the use of black and white photographs compliment the text. The book should be on the reading lists of every university and military academy teaching journalism.